An annotated bibliography of work by Carroll discussed in this interview is below. Noël Carroll may require something of an introduction. As someone who writes books like Theorizing the Moving Image and Philosophy of Art: A Contemporary Introduction, he may strike many readers of Senses of Cinema as a figure whose work would be of no importance, and even a hindrance, to any sort of interesting film culture. For any association with theory may evoke memories of film theory classes and conferences that didn’t make any sense to those of us who, well, like hanging out at the movie theatre, then talking about what we saw there, about how and why what we saw there affected us, and about how that relates to other things, in the artworld and beyond. But Carroll is a film theorist with a difference. For not only has he spent much of his professional life openly warring with the reigning movements in film theory – as in his treatise Mystifying Movies and the co-edited volume Post-Theory – he himself has spent a lot of time hanging out at the movies and thinking about things like: Is it justifiable for a critic to evaluate a film based on a “directorial personality” she constructs? Can a documentary be objective? Can a documentary be true? Are political discussions of films justifiable? What do horror films have in common? Why do people respond emotionally to films that they know are fictional? Is there a way of making films that is inherently “cinematic?” What is the difference between avant-garde film and “movies?” In his wide-range of writing, Noël Carroll addresses many of the most basic issues anyone involved in film culture confronts. The relevance of Carroll’s writing for film world activity comes in part from his own experience. 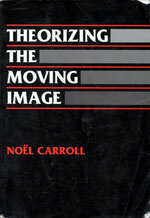 For like film theorists of a bygone era – including figures canonized in the Anglo-American film world such as André Bazin, Siegfried Kracauer, and Hans Richter, as well as contemporaries such as Walter Murch, and numerous overlooked Latin Americans such as Jorge Luis Borges, Octavio Getino, and Fernando Solanas – Carroll has worked in such film world positions as newspaper critic, magazine editor, and documentary screenwriter, and his theorizing closely intertwines with issues he has faced in those positions. This can be seen in even a brief skimming of the twin collections Theorizing the Moving Image and Interpreting the Moving Image. Essays in the former tend to answer the sort of “pure theory” questions posed in the previous paragraph. Yet in them Carroll draws on an enormous range of examples from the history of “moving images” – a term meant to include works from video and new media as relevant to his theorizing – including the conditions of reception he has encountered in avant-garde film circles. Essays in the latter, on the other hand, examine in depth specific works, movements, and moments in film history, including many current at the moment of writing. Yet in them, Carroll draws on an enormous range of philosophical literature. In the interview that follows, Carroll discusses a wide range of his work, some of the controversy around it, and the relation between criticism and theory. In the process we get some biographical background that traces Carroll’s evolution from Catholic school bad boy to avant-garde film guru and editor of Millennium Film Journal to his current life as the web-surfing Monroe C. Beardsley Professor of the Philosophy of Art at the University of Wisconsin-Madison and President of the American Society for Aesthetics. As usual, Carroll’s words are enriched by some wickedly mordant jokes, the specialty of this author of a book called The Philosophy of Horror (perhaps the best book for those new to Carroll’s work to start with) and of numerous essays on the philosophy of humor, as well as of a dissertation and numerous articles on the work of silent film comic Buster Keaton. Such humor helps make reading Carroll’s work not only stimulating, but pleasurable. Ray Privett: Let’s talk about your background. Noël Carroll: I was born in 1947 in Far Rockaway, Queens, in New York City. That’s where Radio Days is set. Through high school my schooling was in Catholic Schools. There I developed an intense, visceral dislike of dogmatism. Perhaps I react to certain film world positions, especially French-derived ones, in the same way I did to Orthodox Catholicism. RP: Were they French Catholic schools? NC: Though I never thought of that connection, they were: Marist Brothers. I went to Hofstra University as an undergraduate. I started writing about film, theater, and art there in the school paper, The Hofstra Chronicle. My editor was Richard Koszarski, now editor of Film History and a Professor at Rutgers University. We also founded a film society together. He was the President, and I was the Vice President, which meant that I carried the projector. The same thing happened in graduate school when I went to the University of Pittsburgh. George Wilson and I founded a film society. George was my teacher; he was an Assistant Professor at the time. He was the President and I was the Vice President, which meant that I carried the projector. I got a Master’s in Philosophy at Pittsburgh in 1970. That was a very bad year for jobs in Philosophy. The baby boom was ending, and opportunities were closing down. I figured that since Philosophy had such a constrained market at the time, I would have a much better chance for an academic position in film, which was something I had an interest in and which was an expanding job market. And also, because it was 1970, I thought that if you were interested in philosophy and film, you could do them together. This was the age of Godard, who, it was said, made his philosophy on film. I came to learn that was pretty much impossible. The more that I became involved in film studies, the more I realized I wasn’t Godard. I also became suspicious of “philosophizing through film,” because it seemed to me that a lot of people, especially in those days, used film as an opportunity to talk about something else that they were more interested in. I see structuralism and psychoanalytic Marxism as examples of that. Film became a vehicle for people to summarize various beloved philosophical and sociological positions. The films themselves took the back seat to telling what Althusser thought. Maybe I had the same bug originally when I moved from philosophy to film, thinking film and philosophy went together like a ham and cheese sandwich. But increasingly it seemed to me that if you wanted to pay attention to film, you would have to develop frameworks for discussing film, and though those might have something to do with philosophy, you shouldn’t just assume a priori that they would. RP: You then enrolled in the graduate Cinema Studies program at New York University. NC: I started at NYU in 1970, and I thought, as we students of Annette Michelson had a tendency to think, that the primary unit of film study was the individual work. We evolved a kind of criticism that we called descriptive criticism, which was supposedly allied to phenomenology, though it was a very free-wheeling type of phenomenology. You wouldn’t read a text by Merleau-Ponty and arrive at what we did automatically. The kernel idea was that what was important was the experience of the film itself. Given this, you tried to unearth the features of the work that gave rise to that experience. There was a strong orientation for dealing with the individual work, though it tended to be descriptive rather than interpretive. Though as a graduate student I did my fair share of descriptive criticism, I was never all that keen on that project because I felt you also have to give some reasons for why you are describing things. Deep down I suppose that is the reason I’ve always been an interpretive critic. Descriptive criticism was very popular in theatre and dance in the early ’70s as well. But I didn’t think film people had the same warrant that people in other artforms had, because in those other artforms, the work is ephemeral. So one reason to value a description of dance and theatrical performances was to make sure that the memory of those works went into the historical record. But since films were on celluloid, we weren’t under the same pressure. And of course when films were put on videotape and as they become widely available on DVD and through all sorts of cable and fiber-optic systems, the need for descriptive criticism diminishes further. But descriptive criticism oriented me toward making the individual work the primary focus, as did the kind of literary education I had, which was in the New Criticism, which, of course, is oriented toward a focus on the experience generally of the individual poem. Interestingly, at that time ambiguity was taken to be the important feature of poems and literary works, while in the film world there were translations of the work of André Bazin, who likewise championed ambiguity in long takes, thereby further encouraging the segue from literary methodology to film methodology, where, once again, the form privileged the experience of the individual work. And also, because the general rhythm of the film class is one class / one film, that structural feature also disposed us to emphasize single films. Those were some of the key facts that in the early ’70s led me to believe that we should care most about works and individual films, and the experience of them. I don’t exactly believe that anymore, though I still think it’s important. This inclination put me somewhat at odds with auteurism, which tended to look at the corpus rather than the individual work. Also, because of how it was practiced, auteurists tended to identify the most important work of a director with the one in which his abiding themes are most prominent. But this seemed wrong to me since the themes in question could be the most glaring ones in certain films just because these were projects the director phoned in. Sometimes films that were the least interesting tended to be upgraded because the director’s signature themes were most blatantly exhibited in them. You might find a weak film directed by Lang from the ’50s looking better than M (1931) because the themes of paranoia and claustrophobia are so pronounced in it. There would be a tendency almost to forget about the work in front of you once you embedded it into the system, with all sorts of counterintuitive results. RP: Auteurism, which is still very much around, usually comes conjoined with commitments regarding the shape of film history, a vehement dismissal of “sociological” criticism, allusionism, and a medium specificity theory. NC: It was also a very thin theory. In a way it wasn’t a film theory, it was a myth, a belief in genius. First there was the myth that these directors were trying to establish their view against the opposition of the Hollywood system. If they did this, it was a kind of accomplishment, almost a free-speech issue. There were these martyrs, such as Stroheim and Welles, and, though he wasn’t an American, Dreyer. These were figures who had these great dreams and suffered all sorts of resistance. Or so the auteurist story went. It was a good story, a good Hollywood story, with a strong myth underneath it. But it doesn’t stand up to either empirical or theoretical scrutiny. It doesn’t stand up to empirical scrutiny because there were an awful lot of highly successful directors who weren’t at odds with the system. Who was Frank Capra resisting? Also, if you think of this as a global idea, that is, that you have auteurs everywhere because there is always this play between the money and the camera, that doesn’t work out either. Ozu was very successful. So auteurism was always weak empirically, and even weaker theoretically or philosophically. For it’s supposed to be based on a Romantic notion of what constitutes artistic genius, but just think of all the periods where artists are not Romantics. You’re right that it continues to be influential, especially among journalists. There are several reasons for this. It does give you a way to keep track of an awful lot of stuff, as is very evident in Sarris’ American Cinema, where a list enables you to keep track of a large number of films by means of certain identifying tags. Auteurism enables you to handle and to quasi-systematize a massive amount of material, and, of course, journalists have to handle a massive amount of material. Another factor in the persistence of auteurism is, oddly, that it’s in perfect sync with what became called postmodernism, even though it came to its fore one and a half or even two decades before postmodernism. If anything it’s an allusionistic form of criticism. Essentially, an auteurist puts films between the crosshairs of other films in a comparison system that is oriented toward directors. RP: Most auteurists also say that what they do is aesthetic criticism, and that it is necessarily divorced from “political” or “sociological” criticism. NC: The idea that the auteurists were not social critics is more complicated than they let on. Sarris did have an anthology called Politics and the Cinema. There was a time when Peter Wollen identified himself as a structural-auteurist. Since you’re not talking about a personality, you’re talking about places or whatever, that’s certainly open to political criticism. And if you look at some of the early ’70s Screen writing, there is the attempt to reclaim Douglas Sirk as a political filmmaker. I guess you have to do more work to understand what Sarris meant by phrases like “sociological,” because in certain ways the auteurists were very political. Art and politics have always been related. Sometimes those relations are complicated, and sometimes they aren’t relevant to the questions one is asking. One thing that’s strange about my being identified as a “formalist” in the film world is that in philosophical aesthetics a lot of my work is about the need for philosophical frameworks to be sensitive to moral and political issues. I also feel that, in my criticism, I have never been a narrow “formalist,” for very often the films I discuss require an understanding of social and political context. As a theorist part of what one has to do is develop frameworks, and I have dealt extensively with evolving theoretical frameworks for discussing politics, ideology, and morality in relation to art in general and film in particular. What I’ve been skeptical about in my writing is the discovery of a handful of fundamental propositions that answer all our questions in a neat way. When you think you’ve found such propositions, you often make errors. You stop looking at what you’re talking about, and ignore the anomalies in what you’re analyzing to keep the theoretical framework intact no matter what. This is a continuing problem in film aesthetics. It’s a little like Who Shot Liberty Valance? The system becomes a legend, and you print the legend, no matter what the facts are. And the particular legend that has been reigning for a long time in places like the Society for Cinema Studies is a grossly misinformed legend. James Kreul: Tell us about the founding of Millennium Film Journal, and what you tried to accomplish there. 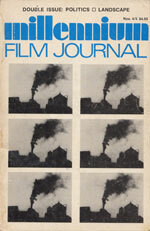 NC: Millennium Film Journal was founded in 1976, though it might have been the case that the discussion began earlier. Vicki Peterson, Alistair Standerson, and David Shapiro were the original editors. Then, after the first or second issue, Standerson resigned, and I was brought on as the third editor. It was founded about the time that October was. I don’t know if there’s any causal relationship between the two. And, of course, it’s hard to resist the suspicion that, since Anthology Film Archives had Film Culture, Millennium Film Workshop thought that it had to have its own magazine, too. I began as an Assistant Professor at NYU in 1976, and I was conscious of the precedent Annette Michelson had set while at Artforum. She published two film special issues with writing by students of my generation – myself, Fred Camper, Paul Arthur, Lois Mendelson, Elena Simon, Bill Simon, Stuart Liebman, and so forth. I had the idea that at Millennium we could do that more effectively – not that what Michelson did was ineffective, but she was only able to edit two special issues. Millennium was originally supposed to be a quarterly, and we thought we could produce issues on avant-garde film four times a year. But this proved incredibly difficult, not only because of the cash flow, but maybe even more because of the copy flow. I was an Assistant Professor who had access to a whole group of graduate students who were right there in Manhattan where a lot of new work was being shown. I thought we could have a perfect symbiotic relationship, one that both sides could benefit from. The students needed an opportunity to write. So here was a journal they could write for, about material that needed to be discussed but that wasn’t discussed very much in the newspapers. The students were in the best possible position. They were downtown and the films were downtown. I imagined that I was in a perfect position to make this work. But I was very arrogant. It didn’t work. But part of the reason was that at the same time the paradigm that one found in Screen and Camera Obscura magazines attracted the attention of graduate students more than avant-garde film did. Post-structuralism, feminism, Lacanian psychoanalysis, as applied to popular film, was what ambitious graduate students wanted to write about. They didn’t want to write about the avant-garde. And though I wrote about popular cinema, too, we the editors weren’t in a position to do that in Millennium Film Journal, because obviously we were connected to Millennium Film Workshop. We owed them, and the work there deserved attention. I had a very hard time getting copy. I would ask somebody to review such and such a show, but they would refuse, asking instead if I would be interested in a deconstruction of Dorothy Arzner. So the magazine didn’t take off in the way I had hoped it would. In the past Film Culture was irregular. Special issues of Artforum and Studio Arts International were good, but they weren’t primed to cover the avant-garde regularly. I felt that all of a sudden we had this Rolls Royce, but no one wanted to get into it. RP: How do you feel about the pieces you did get together? NC: Much of the work was descriptive. But in retrospect it’s unclear whether descriptive criticism was the right way to go with avant-garde film. The sort of enthusiastic approach Jonas Mekas had answered better to the needs of getting word about the work out than descriptive criticism. One problem with descriptive criticism is that, done in its most austere fashion, it’s very difficult to read, and it’s particularly difficult to understand unless you already know the work. So the function of getting the word out was probably not best suited by the type of descriptive criticism we published in MFJ. If you don’t know the work and you read this fine-grained description, it’s very easy to get lost. That’s another of the reasons why I also felt description always needs to be done in tandem with interpretation. Interpretation shows you the forest, and descriptive criticism shows you the trees. There are many pieces I could cite that were first-rate descriptive criticism – pieces by Grahame Weinbren and Fred Camper, for example, in Millennium and elsewhere. But if you wanted to convert people, it wasn’t the right method. Someone like P. Adams Sitney or Gary Doberman would say it was a faux-scholastic approach. But at least one important point must be acknowledged. For stimulating interest, descriptive criticism wasn’t the best approach. That I was a young academic with an academic superego didn’t help matters either. And many other people involved were interested in film history and were trying to write from a historical perspective. They too had academic superegos, and used methodologies for looking at art in hindsight rather than as it happens. Thus, due to these factors, we did not develop a critical approach suitably fashioned to cover a contemporary, living, though marginalized, avant-garde practice. RP: Your criticism was very contemporary, very much involved in the process of discovery and explanation. This contrasts with the sort of criticism you describe in “The Future of Allusion,” now in Interpreting the Moving Image, in which you criticize how allusionism reverses the dialectic of the critic going and discovering things and then trying to explain them. The allusionist critic depends upon cues from the allusion embedded within the film. NC: It’s not just film. As more and more people become artists, there are more and more art schools, and they are generally not conservatories but are folded into the university. This is probably because at some point the parents paying for college were saying, look, you can be an artist, but you need to get a B.A., because if you have a B.A. then you can at least get some sort of white-collar job. We don’t live in a Renaissance city-state, or a monarchy where the royals and the aristocrats order up lots of art, portraits, and public buildings, and are patrons of writers. The church doesn’t do it any more, and in this country the government doesn’t do it either. But people still want to be artists, and artists still have to make a livelihood. So they become more and more connected to the educational system. The university, if only indirectly, has become a major patron of the arts. And, in an odd way, the educational system has imprinted itself on the artworld. The artists are, in fact, patronized by the University, and the artists then build upon University doxa that they get in courses they take in order to get a B.A. So instead of working for Pope Julius and incorporating the accepted theology into your art, you take courses in auteurism, Roland Barthes, and postcolonialism, you get a B.A., and then you put those doctrines back into your art, making it easy for academically-trained critics to extract them hermeneutically. In that sense, the structure of the artworld, especially of the more marginal parts of the avant-garde, is dependent upon the University. The artist speaks the language of the critic because the artist was trained in the language of the critic. Allusionism was just the tip of the iceberg. John Carpenter remakes Rio Bravo in Assault on Precinct Thirteen and so forth, but as you know, outside the commercial venues, there were things like the New Talkies, where whole large chunks of approved theoretical material were reprocessed within the film, and then dug up again by the exegete. JK: This is related to your essay “Avant Garde Film and Film Theory,” which is now in Theorizing the Moving Image. It was inspired by you saying that there should be more film theory in the journal, and then someone saying that, well, we talk about the avant-garde, and it’s all film theory. NC: Howard Guttenplan, the director of Millennium Film Workshop, said that to me. But the quote I originally wanted to start with came from Amy Taubin’s interview of P. Adams Sitney in the Soho Weekly News. Sitney said something like every film is a theory, or every film is theoretical. Originally I started with that. I showed him the article for comment, and he said I couldn’t quote him because it was just a journalistic interview. He meant he was doing something like what Jonas did – saying something that was maybe hyperbolic but would catch the audience’s interest. So I felt, okay, I shouldn’t use that quotation. But I kept my ears open, and the next person who said something like that was Howard Guttenplan. And, of course, there are people who still say things like that, like Ed Small in his book Direct Theory. The idea has been around quite a while. For example, in terms of the talkbacks, the lecture demonstrations that I would hear at Millennium or at the Filmmakers’ Cooperative, the artists would very often present the film as part of a theory. Sometimes that’s what gave the idea of the experiment in “experimental film” real cachet. Often avant-garde films were presented as if they were psychological experiments. I became dissatisfied with this way of talking. When I had gone to the University of Pittsburgh for my philosophy M.A., I thought that I was going to be a philosopher of science. Thus I had certain ideas about what theories were and what science was. So the notion that avant-garde films made theory rubbed me the wrong way. Of course, my philosophical sensibilities also got rubbed the wrong way when semiotics arrived on the scene, and then got rubbed even further in the wrong direction by post-structuralism. I suppose my articles worrying about whether avant-garde films and other artworks make theories were partly motivated by my philosophical training. I have an abiding suspicion, which perhaps I should reflect upon more critically, that neither criticism nor art proper should be simple illustrations of theories. RP: But you do see philosophical theories as relevant to film criticism. NC: If you have a successful philosophical theory, then you will have discovered a concept that will accommodate all the pertinent data. That is the aim of a philosophical theory. It ought to function like that. But one thing to note is that the things that have the best chance to succeed in this regard tend to be pretty thin theories. And this compromises their usefulness to the film critic. It’s not that I suspect that philosophical theories are unachievable, but very often they are either too thin to do the kind of work you want to do as a critic, or they’re too thick to be plausible. That is, in the latter case, they’re not going to cover all the data. My suspicion of the resort to theory in explaining works probably comes from my background in the philosophy of science. When a philosopher hears a general claim, the first thing he does is examine it. When a scientist hears a general claim, the first thing he does is test it. But when film folks introduce general philosophical frameworks in their criticism, there’s a difference. Film people, like literary people, often use these general frameworks as premises for interpretations. They let the generalization stand and then go on to see what work it can do. They tend to reason this way: This generalization is true, and here’s the work we have, and its structures relate to the theory; therefore, they say, the theory is true. My commitments to theorizing are that once you look at the general premises critically you’re more likely to have problems with the general premises than with the concrete descriptions. But film writers rarely scrutinize the general theoretical propositions of their work in the way that philosophers or scientists do. RP: You, of course, do scrutinize these propositions. And that gets you in a lot of trouble. NC: Right. Very often my criticisms of current theories have to do with looking at the foundational premises that film folks haven’t actually paid much attention to. That’s why I complain about the things I complain about in relation to documentaries, particularly in my essay in Post-Theory. If you want to do the sort of critical work one usually finds in relation to Errol Morris, why do you have to commit yourself to the view that there is no truth or objectivity in documentary? It might turn out that some documentaries are true and/or objective, and you might be able to say very interesting things about them. People do useful work in that direction. Why in the world do you have to begin with the most exorbitant premises? I have always thought you should keep your general commitments thin, and try to make your observations so that they’ll be compatible with many different general frameworks. Don’t make commitments about how various mental processes work. That may not be relevant here. Just try to do your work at a level where, if it turns out that, to take some wild example, connectionism is true vs. some other theory of the mind, your findings will be able to be compatible with that. Whatever turns out on the most general map of these questions is the best theory. Why do film people have to make commitments as regards metaphysics and the nature of identity? Of all the claims they have to evaluate, these are the ones they are least suited for. JK: A common reaction to your position on documentary seems to be that you don’t want to talk about ideology, and that you reject ideological criticism. There could easily be confusion between attacking that kind of criticism and attacking someone’s politics. Certain critics want to talk about the politics of representation, and people assume you’re attacking the idea of political criticism. People confuse the two. NC: You don’t have to believe that it’s literally impossible to have objectivity or to set forth any truthful statements in order to criticize the politics of Triumph of the Will. People have been able to do that for decades. Put bluntly, political criticism doesn’t require us to abandon notions of truth and objectivity. And that’s a good thing, since there are objective and truthful documentaries. Let’s take a very trivial example. Take a factory instruction film about how milk is bottled. It doesn’t seem to me that there is any reason to think that the truth about how this mechanism works can’t be conveyed by a perfectly objective documentary film. The only way you can really deny this is by becoming an extreme philosophical skeptic and saying there is no truth or objectivity. But in any sort of ordinary every day sense of truth, what’s the problem? There isn’t a problem. If you want to do political criticism, that’s fine. And I think political criticism is appropriate with a lot of work; in fact, I’ve done it myself. But you don’t need to be committed to the belief that there is no truth or objectivity to do political criticism or to make political films. Since the ’60s people have challenged the notions of truth and objectivity by alleging, in effect, that everything is political. What can one say about that challenge? Well, two things. On the one hand, it doesn’t seem that this is true. Moreover, it’s potentially politically pernicious to regard everything as political, because it takes the force out of things that clearly are political. But, on the other hand, let’s suppose, for a moment, that it is true that everything is political. Still, surely, truth and objectivity can have something to do with politics. After all, to make a political plan on the basis of doing x because I think the reactions will be y and z involves making a prediction. It involves putting one’s confidence in the probability of one thing happening rather than another. And that depends upon whether certain tentative truth claims will be justified or not. Or if politically I condemn the injustice of slavery, I presuppose that the things I’m talking about with respect to slavery are true. So for the purposes of neither the documentary film critic nor the political activist do I see any reason to commit to any of these exorbitant premises about the passing of truth and objectivity. Marx wasn’t committed to them. Why should we be? RP: The Philosophy of Horror is the first book of yours I read. It’s a very accessible book. NC: Good. But it apparently hasn’t been as accessible as I thought it would be. I thought I would be able to retire on it, that it would be a much bigger seller than it has been. I even thought it might be reviewed on the higher end of the popular press. But it wasn’t. I suppose I’m irretrievably academic. RP: It has a cult following..
NC: It has a cult following. I thought it would have a middle-range interest. It still sells very well. I make out okay with it. It’s ten years old, and still doing reasonably well. RP: Why did you write this book? NC: Well, I’ll give you a simple answer, and then we can talk about the bigger things. Routledge had a series of books called “British Authors.” For it, I wrote William Germano a proposal for a little book – these were to be around 100 to 120 pages – on John Wyndham, who wrote The Midwich Cuckoo, from which Village of the Damned was adapted. And Germano, the New York editor at Routledge, said that the series came out of London, and added, “Between you and me, they want British people to write on British authors.” However, he knew that I had given a couple of lectures on philosophy and horror. 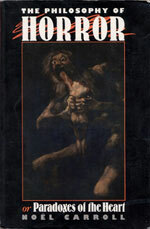 So, he suggested, “I would love a book on the philosophy of horror.” I wouldn’t have actually thought of the book without his suggestion, and I wouldn’t have written it at that point in my academic career because I would have been afraid that I wouldn’t be able to find a publisher. If I had sent it to a philosophy editor, he would have looked at the title and said, “We don’t publish things like that.” But the publisher asking for such a text gave me sufficient encouragement. There were several reasons why I was attracted to this project, some connected to my other work. After all, one thing that is always said about cognitivism, a movement in film theory of which I’m supposedly a prime representative, is that it doesn’t pay attention to the emotions. I hoped people would see that the model I offered in The Philosophy of Horror was actually superior to what was available on the emotions elsewhere. So, in an indirect way, the book was an argument for cognitivism. It was also an indirect argument against psychoanalytic film theory. Probably the very best case that can be made for psychoanalysis in relation to any film genre is the case for horror. In the same vein, one of the best cases, in terms of mental phenomena, for using psychoanalysis with respect to film would probably be what is called identification, since, if there is such a thing, identification looks like it’s pretty close to a mental state that requires psychoanalytic explanation. I had taken a long time picking on illusion theory in Mystifying Movies, but I hadn’t spent a lot of time on identification theory. Some people, even after Mystifying Movies came out, said, “Look, you have to use psychoanalysis because it can account for the intensity of people’s responses, especially emotional responses. And partly it can do it through notions of identification, insofar as you can only have these emotional responses if you are identifying or somehow merging with the image.” In The Philosophy of Horror, I not only attack identification, but offer an alternative approach, thereby, once again, arguing indirectly for cognitivism. So tackling both horror and identification was, so to speak, entering enemy territory. I felt that if I could show that cognitivism was a genuine competitor with respect to such central psychoanalytic themes, then it would have to be taken seriously. Now, I don’t want to make the horror project sound like it was so calculated. It wasn’t that I really liked musicals, but decided to do horror only for the reasons I just gave. It should be clear from the writing that I’ve enjoyed the horror genre since I was an adolescent. It wasn’t as if it was a stretch, the way that if what had been called for was to analyze 1930s Ruritanian Operettas would have been. But it did work out that by theorizing horror I was fielding rival theories in privileged domains of my traditional adversaries. RP: Tell us about the theories you set forth. NC: In The Philosophy of Horror, a general theory of horror is advanced that doesn’t require psychoanalytic concepts. This theory doesn’t deny that some works of horror might be approached best through psychoanalysis, but the default framework that I construct is not psychoanalytic. It is a model informed by developments in cognitive psychology and analytic philosophy. Not all emotional responses require psychoanalysis, though, as I’ve pointed out a few times, most people in film studies and other humanities departments usually move toward it immediately, and, I would argue, without proper warrant. Curiously, in earlier work, I had actually attempted a psychoanalytic theory of horror. So in some ways the book is also a reaction to my own earlier attempts to characterize horror using psychoanalytic notions, especially ones derived from Ernst Jones. It struck me that certain genres, such as suspense, mystery, comedy, melodrama, and horror, are actually identified by their relation to certain emotions. As a case study, I went about analyzing horror. I began by looking at what kind of horror we expect from horror fiction. At the time, a leading theory of the emotions was what was called the cognitive theory of the emotions, which tries to identify emotions in terms of their object – that is, the criterion that determines whether or not a state is this or that emotion. For example, in the case of fear, in order to be afraid you have to be afraid of a certain kind of thing, namely something that meets the criterion of harmfulness. I argued that horror was made up of two emotions we are already familiar with, fear and disgust. So I crafted my theory of the nature of horror by saying that horror is defined in terms of its elicitation of fear and disgust. Then I needed to say what the object of those two component emotional states were. For fear, there was a long history of analysis of the formal criterion as the harmful, and I drew on that. For disgust, I hypothesized the criterion was the impure. RP: You argue that in horror fictions these things that are harmful and impure are monsters. NC: Yes, where monsters are defined as things not acknowledged to exist by scientific lights. So the emotion of horror is elicited by beings not acknowledged to exist by science that are both harmful and impure. RP: You also deal with, more generally, why people respond emotionally to things they know do not exist, as relates to horror fictions and other fictions as well. NC: It is widely believed that people can only be afraid of what they know exists. But at the same time, when they are reading fictions, people know that they are reading fictions. If you put those together you should get the conclusion that people can’t be afraid of horror fictions. But they are. So the theorist has to come up with an explanation. The reigning theory in film studies of course was that there is a contradiction there, and that requires us to postulate some kind of psychoanalytic state that makes it happen, such as disavowal. Postulating that state leads you to surmise that because this disavowal operation swings into place, the spectator must be under the illusion that what she sees at a fiction film is the real thing. This gets us to the illusion theory of response to fictions. To counter this theory on the negative side, I pointed out that beliefs have behavioral consequences. If people really thought that there were monsters in the movie house when they were watching horror films, they would try to escape or confront them. There would be a fight or flight response. But there isn’t. So that’s one reason not to believe this set of presuppositions, which I had also attacked in Mystifying Movies, though not in as finely directed a case as this one. That was the negative side of the attack. The positive side required that I come up with some kind of theory of what is going on that renders non-contradictory that we are both in the state of fear when we watch horror films and at the same time we are not irrationally believing in the fiction. To do that, I proposed what I called a thought theory. I argued that we can find ourselves in emotional states by simply imagining certain things to be the case. On my view, to believe something is to hold a proposition in your mind assertively. But I suggest that we can also entertain propositions in our minds – that is, reflect upon them non-assertively. Furthermore, I argued that it’s the case that when you entertain a proposition non-assertively, you can nevertheless put yourself in an emotional state. Just think of a time when you’ve been in a high place, such as overlooking the Grand Canyon. You look at the edge and imagine yourself going over. You know you’re not going to do that to yourself, but nonetheless it can send a shiver up your spine. So it’s possible that merely entertaining a thought can put you in an emotional state like fear. Then, when we turn back to the problem of fiction, the solution seems open to us. What the filmmaker or novelist does is present to us propositional content that we entertain in our minds non-assertively. That gets us to the point where we can say unblushingly that we fear the fictions, even though we know that what the fiction alleges to exist does not and cannot harm us. RP: You also posit that within fictions there are often characters who cue how we should respond to the fiction, including, in horror, to monsters. A canonical example might be the character played by Jamie Lee Curtis in Halloween. But rather than saying we identify with these characters, you say we assimilate their positions. NC: A lot of people would say that if we asked people how they respond to horror films, the reactions would be too subjective to develop any theory. So I needed something objective. I suggested that you can get that by looking at how these characters respond, because horror, like some other genres, seems to frequently be characterized by a convergence between audience and character response. I don’t, however, claim that we always need these characters to cue us. For example, there are horror fictions where the character for some reason might not be available to or necessary for us. The monster will be portrayed effectively enough that we don’t need to be cued. If you see a nine-foot drooling spider figure advancing, you don’t necessarily need a character to cue you that this is fearsome and disgusting. Nevertheless, there is the question of what our relationship to these characters, especially their emotional states, is. Very often in film studies, one says that the emotional state in relation to the character is identification, that you become one with the character. I thought, and I still think, that this is not the best way to model this relationship. If you look very closely at fictions, probably most of the time the psychological state of the viewer is different than the psychological state of the character. Consider the cases of tragedy and comedy. We pity the tragic figure at the end of the tragedy. The tragic figure is upset, but he or she isn’t usually feeling pity for himself. Very often he is feeling guilt or shame or remorse for something he has done. We aren’t feeling guilt or shame or remorse. We are feeling pity. Then, if you think of comedy, when the comic figure takes a pratfall, we’re amused, but generally the comic character is not. My point is that identification isn’t a good theory of our relationship to characters, because very often our emotional state in relation to the characters is not marked by shared emotions. Still, we have to have some sense of his perspective in order to actually pity him. That’s what I call assimilation. We feel bad for the character partly because we see how it is that the character, such as Oedipus, feels the way he does, such as guilty and shameful. But we don’t identify, or become one, with him, though we need some access to that viewpoint. Assimilation is access to a viewpoint without sharing the same psychological state as the character. RP: The book explores many other issues, including characteristic horror plots and why people would actually want to expose themselves to movies that horrify them. And then you end with a fascinating comparison between postmodernism and the contemporary horror cycle. NC: Postmodernists and horror fans would seem to share some of the same anxieties, or so I suggest. The postmodernists share them from an esoteric point, while they are manifest more exoterically or overtly in horror films. For example, in the horror film, it seems to me that there is an anxiety about the stability of the world, and it also seems that a similar anxiety is a grounds for postmodernists’ denial of any kind of foundation upon which to base knowledge. RP: Tell me about the book’s reception. Have you heard anything about any horror filmmakers reading it? I could imagine someone like Wes Craven, the director of the Scream movies, liking it a lot and drawing on it. NC: Not yet. I thought I made the book in such a way that, though I can’t do it, it could be tested by psychologists. And, as you suggest, the other way that it could be tested would be by filmmakers who use it to generate horror imagery and plots. The book has only been out for a little more than a decade. I know it has been used a lot as a textbook. So maybe some day down the line some freshman who didn’t want to read the book, and just wanted to watch movies, but had to read the book in order to get a film degree, will grow up to be a director, and she’ll start using the book. That would be a fond hope of mine. If anyone did that and came forward, that would be a good confirmation of the theory. Maybe, however, a filmmaker would want to undermine some of my generalizations. I think that’s fine; it’s part of the conversation of theory. In fact, I hope that happens, because I think that film theory should be closer to the practice of filmmaking and fiction-making in general. There shouldn’t be these two cultures. I think in some ways the theorists have made these two cultures exist by being unconcerned with the problems of construction. The Philosophy of Horror is very concerned with the problems of construction. It’s a philosophy of horror, but in the same way that Aristotle’s Poetics is a philosophy of tragedy. Aristotle wrote a philosophy of tragedy, but he called it a poetics, where poetics is a notion that comes from poesis, which comes from making. So poetics is about construction. His philosophy of tragedy is a philosophy of construction of tragedy, and I had hoped that my Philosophy of Horror would be a philosophy of construction of horror in much the same way. RP: Tell us about your writing on medium specificity, much of which is included in the first section of Theorizing the Moving Image. NC: I suppose the idea of medium specificity was more popular prior to semiotics and post-structuralism. Though I think if you look at Metz’ writing, even though his followers forget this, he actually tends to be committed to medium specificity. And most popular critics accept medium specificity as well. Also, as our culture becomes more obsessed with media like digital media and computers, you’re finding people are slipping back to talk about specificity of media. There was a recent book about interactive computer writing called Hamlet on the Holodeck, and the author evokes notions of media specificity for endorsing certain stylistic choices with respect to interactive narratives. I think especially when new technologies are introduced, the invocation of medium specificity is a sort of natural rhetorical move to make. Someone claims the new medium fills a need or a niche, and that certain ways of using it are the right ways to use it because of the nature of the medium. RP: What’s the difference between a medium specificity theory and an ontology? NC: As I understand them, medium specificity theories that emerged in film theory, and that you often find in, say, fine art theory, like Greenbergian modernism, are attempts to identify the nature of the medium for the purpose of then going on to prescribe recommendations about what you should or should not do in the medium. It’s not only that these things have a nature but that nature actually tells you or even dictates to you what you should and should not do. It tells you what the legitimate possibilities in a given medium to explore are. RP: It can be a very elitist thing. People say things are not cinematic, and they dismiss them as therefore not worthy of attention. NC: It’s certainly dismissive, especially when it’s used in that way. It’s hard to say whether or not it’s elitist. Sometimes you have to look at the context. Certainly in the ’60s when people were talking about “the cinematic,” they declared Hitchcock to be the most cinematic director and Bergman to be the least cinematic. But there was something very populist about that. Medium specificity became a way to enfranchise works that leaders of the artworld and literary world disparaged. It’s a complicated issue. Can you say that medium specificity theorizing is elitist in all times, or do you have to decouple the concept of it from the uses it can be put to in certain contexts? The Russian Montagists were committed to medium specificity, but at least in certain periods they claimed that, through montage, they would be able to make connections with the mental processes of ordinary folk in a highly immediate way. I think the question of whether or not medium specificity is elitist depends upon how it is deployed and in what context it is deployed. People like Miriam Hansen suggest that Kracauer’s film theory turned out to be elitist because it was his way of reacting against Hollywood commercial film, and valorizing Italian Neo-Realism and other realist tendencies. I don’t know whether or not that accusation is right. But there would be a case that would support the accusation that it is elitist. But when Robin Wood used medium specificity in the ’60s, in order to enfranchise Hitchcock, it was meant to free things up. RP: It freed certain things up, but as Jonathan Rosenbaum points out in “Guilty By Omission,” that freedom came at a certain price. (1) For some this has involved a vehement dismissal of films in certain styles and with certain political commitments as “not cinematic” or “not artistic.” I think something similar happened in Europe, with Truffaut’s “A Certain Tendency of the French Cinema” essay, along with his interviews with Hitchcock and Godard’s writings on Nicholas Ray, serving as medium specificity cudgels on both continents. If critics influenced by these medium specificity theories encounter some film that doesn’t use voiceover on tracking shots and have poignant moments of editing then it is dismissed as not cinematic and thus not worth discussion. Yet this film might be of major importance within film history, including within stylistic history, for some other reason. Or if a “political,” or “ethnic,” film does happen to be “cinematic,” it is taken as important only insofar as it is divorced from its political or ethnic context. NC: Right. But look at Brakhage. Brakhage believes in the “cinematic;” he once claimed that film is essentially a visual medium. I don’t know if he maintains this today, but at various points in his career he has maintained that talking is untrue to the medium. He has made very few talking films, such as Blue Moses. He uses medium specificity as a cudgel, as you say. But of course Brakhage thinks he is David, and this is a cudgel against Goliath. So when you make these claims about medium specificity being elitist or non-elitist, I guess you have to take into account context. Though I suppose you could respond to me by saying that while Brakhage is the underdog, he is still an elitist. That may be true, and perhaps this is what you’re getting at: that medium specificity theories, when you examine them in detail, tend to have certain stylistic commitments, and those commitments may be connected to artistic rivalries in specific contexts. On the other hand there is an ontology, which is a robust theory of necessary features, often arrived upon through debate among theorists. I suppose a lot of people will think this is naive, but I believe that you might be able to get the ontology of something without having stylistic biases, and without it taking a position in any stylistic rivalries. Let’s not take my theory of the moving image as an example, because you might say I have a vested interest in it. Instead let’s take Arthur Danto’s theory of art, which I have criticized elsewhere, but which I still think is interesting. Danto says that art can be any kind of thing. That doesn’t look like it has any stylistic commitments. If it has implications for criticism, it is that critics like Danto himself should be pluralist. They should be ready to find the kind of value that there is to be found in the work in question. Danto has an ontological theory, a theory of necessary features that all art has, but one that doesn’t seem on the face of it to be stylistically biased. Maybe some people would say Danto’s theory is biased, because all art has to be about something for him. But that hardly amounts to a stylistic bias. Think of the difference between Danto’s theory and Greenbergian modernism, which certainly separates the chaff from the wheat in a much more decisive manner. Danto’s theory allows critics like Danto to be open to any kind of artistic project. No specific project follows from the theory. Medium specificity, as I’ve been using the term, suggests something about which projects are correct and which are incorrect in the relevant medium. Moreover, according to the medium-specificity theorist, these projects are determined by the nature of the medium. In response, the ontologist observes that the medium may still have a nature, even if there are no stylistic mandates that follow from it. 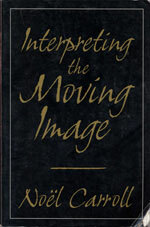 Now, in some of my writings I’ve offered a concept that I call “the moving image.” I try to specify precisely what I mean in the “Defining the Moving Image” essay in the first part of Theorizing the Moving Image. If the conceptualization is apposite, it will apply to moving images that will be made a hundred years from now that I’ll never see and never understand. But, on the other hand, there’s not much you can tease out of my notion of the moving image that is of critical value. The concept classifies a certain body of work, but it classifies it in a way that, unlike classical film theory, doesn’t have any obvious commitments to one style or another. Maybe some time down the line someone will look at my proposal and say: he thought it didn’t have commitments because of where he sat in the historical stream, but now because of such and such developments, we see that Carroll did have these commitments. But let me say at least this in my favor: Kracauer, Arnheim, Bazin, and Eisenstein had their cards on the table. They knew what their stylistic commitments were. They were at least self-conscious. If my theory comes with stylistic commitments in tow, it’s because I’m ignorant, and not because I’m a polemicist. I want to say a few other things about this. Sometimes when a person like me opposes medium specificity, people take this to mean that I’m saying that an artist doesn’t have to pay attention to her medium. That’s not what I mean at all. I think that artists should learn about the medium they are employing, and the various options that it affords them. They make certain discoveries about it, and they learn their craft by mastering their medium. Basically, my position is that the medium doesn’t tell you what you should or shouldn’t do with it. In certain cases, making something that’s more “stagy,” less edited, or less morphed, may actually be significant in an artistic tradition, or be a notable innovation. Being “uncinematic” may be artistically important even if it violates the notion of medium specificity. But my willingness to endorse breaches of the “laws” of medium specificity is not equivalent to a denial that artists should have intimate knowledge of the media they work in. The other point I’ve always made about these discussions concerning medium specificity is that there’s a way in which the medium specificity tradition is trivial. If it’s not possible to do something in a given medium, then it won’t be done. Everything that can be done is possible. And then the issue is not whether or not what you’ve done is possible, it’s whether it’s interesting. It’s interesting that Straub made certain kinds of films with static cameras in the periods he did. It’s interesting that Caligari is as static as it is. But you have to look at the work in its context in order to make that determination. It is not simply a matter of consulting the so-called laws of the medium. JK: It seems what you’re saying is the difference between prescriptive and descriptive projects. Similarly, the core work in A Philosophy of Mass Art seems to be more descriptive, setting forth an ontology of mass art without prescribing or proscribing. NC: I call it a classificatory theory. I think a lot of previous theories of mass art were commendatory or, as you say, proscriptive. Certainly Marshall McLuhan’s and to some extent Walter Benjamin’s theories tend to be commendatory. Others – Theodor Adorno, R.G. Collingwood – seem to be proscriptive or evaluative. They’re certainly not prescribing certain kinds of mass art, they’re more or less condemning it all. Such theories are evaluative in that respect. I claim my theory to be descriptive. I could imagine some artist complaining that I’m not descriptive. They might say that, since I regard mass art as things produced and distributed by mass media, and since they produce only one-off artworks, why am I excluding their work from the order of mass art? I don’t think that’s a real problem. I’m not saying that the work is bad by saying that it is not a work of mass art. So, on the one hand, if that is what the artist is worried about, she shouldn’t be. Also, I’d want to know why an artist thinks that one-off produced artworks should count as mass art. RP: In the process of defining mass art, you make a parallel comparison between avant-garde art and fine art. I get the sense that you are fighting some very old artworld battles here, for example, as an advocate for the avant-garde, wrestling with why newspapers, magazines, and establishment museums rarely feature avant-garde art, while they regularly feature fine art, and often feature mass art. NC: Well, look, obviously there is a battle internal to the artworld concerning mass art. It’s not just my thesis that historically the avant-garde has perceived mass art as its other, its competitor. And the avant-garde has made various attempts to disenfranchise mass art – not all avant-gardists, but certainly many. I tried to suggest in Philosophy of Mass Art that if you look at the current arguments against mass art, even though they may have trickled down and have been used by people who are not avant-garde artists, they are almost always traceable back to people related to the avant-garde. When people argue about mass art, “Well isn’t this a pseudo-art?,” usually they are people with strong commitments to the avant-garde, like Adorno, Greenberg, Collingwood, and Ortega y Gasset. This isn’t to say that there aren’t avant-gardists who are in some way sympathetic to popular art. But when avant-gardists appropriate popular art they almost always do it in a way that translates it into their own language. Think of Potemkin, when people are hurled from the side of the ship and they do these triple acrobatic turns in midair. That’s not just simply an embrace of popular entertainment. It is also a gesture of defiance flung at certain canons of realism, the kind of realism that people came to expect from ordinary films. And when surrealists appropriate popular art, they do it in order to savor its strangeness, its alien-ness. Frequently, in order to do this, the surrealist takes a popular image out of its narrative context in order to foreground its strangeness. RP: This brings us to how your work relates directly to artworld practices, even in the extended treatises. If arts editors of major newspapers or curators of major museums were to read A Philosophy of Mass Art and Philosophy of Art: A Contemporary Introduction, and take them to heart, there would be no reason for them, from an aesthetic standpoint, not to provide the same amount of space to work from any tradition whatsoever, including avant-garde and mass art, that they do to work by certain fine artists, or “art cinema” filmmakers. There would obviously be economic reasons, in terms of who pays their bills. Similar things could be said for trade organizations and government regulators. NC: I think the way you have framed the question is related to the fact that you come to the issue from the film world, and particularly the avant-garde film world. You might not want to generalize from that case, because there’s something very peculiar about it, and maybe we should talk about that. This is what I mean by saying it’s peculiar: most of the fine art that is reviewed in The New York Times is avant-garde art. Maybe I’m wrong about the statistics, but there are feature articles on people like Ann Hamilton. If you’re dealing with the world of painting, there will be a terrific amount of coverage in that direction. Probably most of the dance that you see reviewed in the New York Times – and there is a lot of it – will be avant-garde, or at least modern. And I don’t just mean modern in the sense of modern dance, but also the works of Balanchine, which they endlessly review, and his work surely has a pretty good claim to be called avant-garde. Anything Merce Cunningham does is going to be reviewed. Also, the theatre pieces at the Brooklyn Academy of Music, including the big 1980s operas, all got coverage. The question is, how is it that the avant-gardes of all of those artworlds are able to command such coverage in print, but the film world never has been able to. Why is that? There are several theories. One that Annette Michelson and Paul Arthur have offered is that since film is a popular art that shapes the expectations that people have of film. They expect film to be entertaining. But I’ve never been fully convinced by that argument, because in the ’70s and ’80s performance art and dance, to a certain degree, were able to make crossovers, and probably most people’s experience of dance were in popular milieus, things like Las Vegas-style shows, jazz dancing, and so forth. And with performance, they thought of the dramatic theater. So I don’t think it can just be that people’s associations are with the popular forms. There’s another issue, and it has to do with the filmic avant-garde itself. Why is the filmic avant-garde unable to exploit postmodernism the ways that the others have been able to? RP: I’m not just thinking about the avant-garde. I’m thinking as well about films that don’t get distributed: films that might show only once or twice and whose makers would gladly make thousands more prints and videotapes. NC: You’re not just talking about any foreign film, though, you’re talking about what is called art cinema. RP: No, I am talking about any foreign film, or any film whatsoever, beyond “art cinema.” If you are truly interested in film art, then, following your work on medium specificity theory, your thesis in Philosophy of Mass Art that mass art, avant-garde art, and fine art all deserve the same attention, and your thesis in Philosophy of Art: A Contemporary Introduction that art is defined historically through conversation, any justification a critic makes about not reviewing something because it is not art, or considering it in general, fails. There must be other reasons – economic, perhaps, or personal, or political, or some combination thereof. Even “art cinema,” a concept based on a medium specificity theory that conflates certain styles and conditions of reception with the artform itself, is just a sampling of film art as a whole. But perhaps I’m projecting onto your work. NC: I see your point, but it’s not that a critic like David Denby owes distributors; he owes his editors. RP: And his editors, in turn, owe the publishers, who make money from distributors taking ads. NC: One reason that avant-garde film wasn’t reviewed in newspapers during my time as a critic had to do with the avant-garde film world. Newspapers didn’t count it as news, unless you came up with a piece before the work was shown. If it was only going to be shown once or twice, they thought, wrongly or rightly, that people didn’t want to read a piece three days after about a film they couldn’t see. But the problem was, as you know, the artists often don’t get their work done until just before the screening. Sometimes they’re cutting it as they project it. Moreover, most avant-garde film venues are very tolerant of this. The venues which were not tolerant of that kind of thing – the Whitney Museum and Karen Cooper’s Film Forum, places that had advance screenings for all of the critics, somewhat on the model of what commercial theaters did – always got better coverage because they were willing to adapt to the way newspapers are edited. That was always a real problem: that the avant-garde venues would not play the newspaper’s game. The other thing was that newspapers want to cover things that they think will generate a wide interest. They don’t say, “David Denby, don’t cover this because it’s not art.” They say don’t cover it because our readership is probably more interested in some other thing. But even if he argued with them to get permission to cover some unusual things once in awhile, then he would either have to do a preview so that they would be satisfied that he was writing about something that readers could see; or, if it were a review, it would have to be something that would be screened again, otherwise it would not be considered news. I don’t want to cast aspersions on either of you, but you’re probably very tolerant of the foibles of avant-garde filmmakers. We have seen what can happen: a filmmaker is in the bathroom cutting the film, or the screening doesn’t start until 45 minutes after it’s supposed to because the filmmaker is fiddling with a glass of beer in front of the projector lens, and so forth. And there are people who are legendary for this kind of thing, like Jack Smith or Ken Jacobs. This makes for charming anecdotes. But newspapers with deadlines will not be amused. They’ll just ignore the event. This goes back to the question of why dance and performance art were able to mainstream themselves at least a bit more than film. Spalding Gray does his performances on television. It’s cable television, but it’s still television. You won’t find many avant-garde filmmakers on television any time soon. Why hasn’t the filmic avant-garde been able to cross over in the same way? In the avant-garde film world, I think, there is a sense of entitlement: that the avant-garde film world should be entitled to the same audiences that Steven Spielberg has. Since this hasn’t happened, there’s a feeling that there is injustice here. On the other hand, folks in the avant-garde community are not only hermetic, but they actually pride themselves on their hermeticism. They pride themselves on their difficultness. This kind of eccentric “genius” behavior is positively reinforced in the New York film world. “Yes, so and so is behaving very erratically, but he or she is a genius.” There is an emerging tension here: you can’t expect, on the one hand, to have the audience that Spielberg has, and, on the other hand, at the same time doggedly be committed to a hermeticism. I’m not someone who tells people not to be hermetic. But I do say: live with it, and don’t just sit back and ask, “Why is this happening to me?” I think the institution of the filmic avant-garde, and its myths about itself, reinforce its commitment to inaccessibility. And that’s okay, unless you expect large audiences. Obviously, if you do want mass audiences, something has got to give. What the dancers and the performance artists did, partially under the flag of postmodernism, was to make themselves more accessible. They put something in their art that people could hold onto, even if they didn’t actually speak the hermetic language of the artform in question. JK: Do you think that the possibility of having commodities associated with performance art also distinguishes its success from the lower visibility of avant-garde film? The filmic avant-garde, for the most part, would not make their films readily available on video. But Spalding Gray is on cable and has two theatrical films, Eric Bogosian has video tapes of performances available, Karen Finley has monologues in book form, and Philip Glass has CDs, all of which are more or less available at any bookstore chain. Anyone can investigate these artists from anywhere. And to relate this back to your points about publicity, one gets the sense that dancers and performance artists understand the value of a good publicity photograph, not just in terms of images for posters, but more importantly having photographs available for newspapers and magazines. This often doesn’t work the same way for avant-garde films, not only because filmmakers don’t always make publicity stills available, but also because frame enlargements of avant-garde films are often not very useful for arts editors and photo editors. They often don’t illustrate what the film is about the way that narrative film stills do. NC: You’re making an excellent point, and I think it follows from mine, in that it wasn’t simply that the avant-gardists didn’t show work to critics in advance, but also that they didn’t supply the standard materials included in a press kit. Even if you can’t make frame enlargements available to journalists, you could at least make photographs of the artist available. That’s a way to claim space in a newspaper: have the best picture. But avant-garde venues were often remiss even in this. The avant-garde filmmakers working in 8mm and 16mm film, of course, generally didn’t want to go on videotape because they felt it somehow betrayed the medium. And, of course, to a certain degree I understand that. On the other hand, Ridley Scott didn’t mind having Alien on tape, even though you can’t see half the film because it’s too dark. RP: Related to the refusal to make publicity materials is an extreme valorization of the experience in the movie theater. You can see this as well in the importance of a film being the original print upon which, say, Brakhage scratches or paints. Curiously, it makes it something like what practitioners of third cinema call a “film act,” in which the experience in the movie theater is absolutely constituent to what avant-garde cinema is. It’s antithetical to the idea that you make a film, you show a print to a few people, hopefully someone makes arrangements to distribute it, and then you make thousands of prints and videotapes. NC: Right. It makes it more like a play or performance. It also commemorates it, like going to church on Sunday. And there’s nothing wrong with that, unless your expectation is such that you then feel defeated when you don’t get attention from newspapers and so forth. Maybe one way to solve the problem of the end of the avant-garde is to abandon that expectation. That’s one way to make the problem disappear. On the other hand, maybe history will just swamp these issues in its wake, since probably the next interesting stage in the avant-garde will not be in the theaters, but will be digital. Pretty soon video e-mails are going to be marketed. That is going to have momentous consequences. In a literate society, almost everyone has the basic skills to be a writer – to write a story or a novel. Now, on the internet, we’re going to enter a cultural period in which everyone who is computer literate will have the capability to be filmmakers using computerized editing systems. A lot of people are going to be very lazy and make emails that look like conventional films. But when you have millions of people involved in image-making, the possibility of the emergence of more and more quirky people who think differently and have different ideas simply multiplies. That, I think, is where we are more and more likely to find the action in the future. JK: But it seems like too many people are buying into the utopian vision of the internet, that everyone will be an image maker, and therefore all problems will be solved. There will still be discrepancies in distribution. Even though a lot of people will be able to create images and make them available, in terms of creating an avant-garde practice, this is not enough in itself. There’s more to it than access to equipment and the ability to send images to someone. NC: Yes, you’re right, that’s not going to get you anywhere. But what is hidden in those two elements – access and distribution via internet – is millions and millions of people. My prediction is that once you have that many people making moving images, the likelihood of a small subsection who have decided to do something interesting will greatly increase. As soon as people have these video emails, some people will start using archive resources and use found footage to fool around digitally, the way people now play with their answering machines. A lot of this stuff is just going to be very kitschy. But then there’ll be some people who take those resources and figure out how to use them, and use them for innovative purposes. So it won’t just be people who take film classes or video classes who will be the new producers. Everyone will be. It’s the numbers that lead me to make the prediction. It’s not because I’ve seen any interesting work yet. So far, most of the computer work I’ve seen has only been interesting because of an interesting use of technology. For example, I’ve seen these performances, sort of “video across the seas,” where you have people interacting on a screen, with one computer in England and one in the United States. Though thousands of miles apart, they are doing something in front of you together. Basically, the image itself is pretty uninteresting. It’s only when you learn a little about the technology involved that it becomes interesting. But you know, in early film, there was a hell of a lot of junk. It’s not like every one of those early films was a jewel. In fact, very few of them were. But once the technological novelty was outgrown, something aesthetically interesting happened. I think the same process will occur in the digital arts. I hope to be around to see it. Mystifying Movies: Fads and Fallacies in Contemporary Film Theory. New York: Columbia UP, 1988. A systematic dismantling of almost all Anglo-American academic film theory of the 1970s and ’80s, with a counter proposal for how film theory should be conducted. The most polemical and controversial book Carroll has written. The Philosophy of Horror, or Paradoxes of the Heart. New York: Routledge, 1990. An investigation of the nature, history, and characteristic structures of horror fictions, as well as issues of how and why people respond emotionally to works of horror and fiction in general. Perhaps the best place for those new to Carroll’s work to begin. “Nonfiction Film and Postmodernist Skepticism.” Post-Theory: Reconstructing Film Studies. Eds. David Bordwell and Carroll. Madison: University of Wisconsin Press, 1996. pp. 283-306. An abrasive and polemical dismantling of almost all theoretical writing about documentary during the 1970s, ’80s, and early ’90s. Theorizing the Moving Image. New York: Cambridge UP, 1996. A collection of essays in film theory, exploring such topics as the implications of the nature of media for the way those media are put to use, sight gags, avant-garde and documentary film, and various figures and movements in the history of film theory. 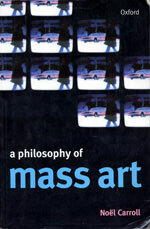 A Philosophy of Mass Art. New York: Oxford UP, 1998. An argument for the relevance of mass art for philosophical aesthetics, with proposals regarding the nature of mass art in relation to fine art and avant-garde art, and in relation to the emotions, morality, and ideology. Interpreting the Moving Image. New York: Cambridge UP, 1998. A collection of essays examining in-depth specific works, moments, and movements in film history, including films directed by and starring Buster Keaton, the transition to sound, and Hollywood film of the 1970s (and beyond). Philosophy of Art: A Contemporary Introduction. New York: Routledge, 1999. 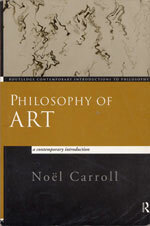 A textbook introducing the techniques of analytical philosophy in relation to the history and practice of the philosophy of art, including Carroll’s innovations in the field. James Kreul is a Ph.D. candidate in the Department of Communication Arts-Film at the University of Wisconsin-Madison, USA.